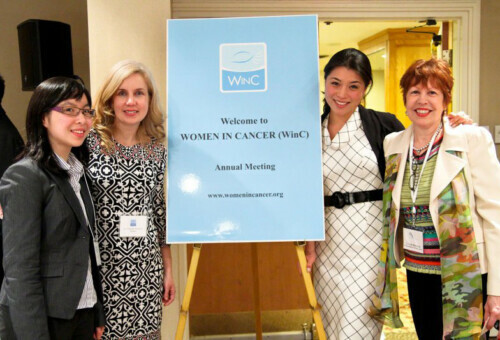 Women in Cancer (WINC) is the new “girl” on the block. Home grown in Canada, this exciting new organization was created to confront the ever widening gap between the increasing number of cancer care women physicians and their low numbers in leadership in their field. Not a new story, but perhaps a new model that transcends “specialty” organizations and brings women physicians together in a new and exciting way. Most of our networking is done through established medical organizations that have networking as just one of the “side-bars.” Exchange of scientific information and education are the main attractions. Just getting to these meetings is difficult. And breaking into the leadership structure and changing the established ways business is conducted can be difficult in these behemoth organizations, which as we all know, are resistant to change. So here comes WINC. Just barely one year old, WINC boasts 283 oncologist, hematologists, and trainees. Put into the context of a total Canadian physician workforce of about 75,000, this is an extraordinary statement. Women clearly want opportunities to network and by combining it within their “specialty” (broadly defined as cancer), they are able to bring together physicians from different areas–surgical oncologists, medical oncologists, hematologists, and radiation oncologists. Confronting the divide of super specialization, this approach is visionary. The pool of women to help support and promote each other is increased and is built around multiple specialties with an interest in a very broad medical field. But like all such endeavors, two challenges loom large. First is funding. Membership is free, so how does WINC create revenue to meet its goals? Second is programming. How do we “meet” and “greet” and keep the energy going and the time spent worthwhile when it is more difficult to travel and time is at a premium? This Canadian organization, led by the indefatigable Christine Simmons, MD, based in Vancouver, BC, looks to engage women in the US. And like WMDR, WINC wants to create programs in this virtual community that are relevant, easily accessible and impactful to the individual and for the group. Membership is free. In the early stages of discussion (to be continued face to face in Vancouver in September during Women in Medicine Month), WMDR and WINC are looking to engaging all women in medicine organizations to collaborate for the benefit of the patients we serve in whatever way we serve them. Increasing our effectiveness will mean increased collaboration. Women physicians are key to defining the new normal for medical practice. From patient care to political advocacy, we have to be at the front lines. Our voices have unique perspectives to bring to the conversation. We will keep you posted on new developments and hope you will share (in the comments below) your thoughts of how to build on the momentum created when women physicians work together. Join in the discussion, and we will keep each other posted!